Atrial flutter is the second most common pathological tachyarrhythmia. Only atrial fibrillation is more common. Atrial flutter occurs almost exclusively among persons with significant heart disease, predominantly ischemic heart disease. However, most cardiac conditions may be associated with atrial flutter. As compared with several other supraventricular tachyarrhythmias, atrial flutter does not occur among otherwise healthy individuals. Atrial flutter causes characteristic ECG changes, as discussed below. Acute atrial flutter (includes newly diagnosed cases). The observant will notice that the classification differs slightly from that of atrial fibrillation. Acute and paroxysmal cases are common in clinical practice. Chronic flutter is, however, very rare. Thus, as compared with atrial fibrillation, atrial flutter is not capable of persisting for longer periods of time. This is due to the fact that atrial flutter is caused by a macro re-entry circuit (a large re-entry circuit) and re-entry circuits are vulnerable processes that usually self-terminate within minutes, hours or days. In the vast majority of cases the re-entry circuit in atrial flutter is located in the right atrium and it typically loops around the tricuspid valve. Impulses spread rapidly through the atria from this re-entry circuit. The ECG shows regular flutter waves (F-waves; not to be confused with f-waves seen in atrial fibrillation) which gives the baseline a saw-tooth appearance. Atrial flutter is the only diagnosis causing this baseline appearance, which is why it must be recognized on the ECG. The flutter waves (on the contrary to f-waves in atrial fibrillation) have identical morphology (in each ECG lead). Flutter waves are typically best seen in leads II, III aVF, V1, V2 and V3. The exact appearance of the flutter waves will depend on the location and direction of the re-entry circuit. In the most common type of atrial flutter, the re-entry loops around the tricuspid valve in a counter-clockwise direction. This yields negative flutter waves in II, III and aVF and positive flutter waves in V1 (Figure 1). If the re-entry has a clockwise direction, the flutter waves are positive in lead II, III, aVF and the P-waves typically have a notch on the apex. Please note that for most clinicians it is not necessary to be able to determine the direction of the re-entry loop. Figure 1. Typical atrial flutter. 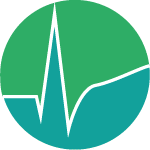 The atrial rate (i.e the rate measured between flutter waves) typically ranges between 250 and 350 beats per minute (which is slower than the atrial rate in atrial fibrillation). The atrioventricular node is not capable of conducting all impulses, which is why some impulses will be blocked. The degree of blocking in the atrioventricular node is specified by counting the number of flutter waves preceding each QRS complex. If 3 flutter waves occur before each QRS complex then it is 3:1 block. If there are 2 flutter waves before each QRS complex then it is 2:1 block. 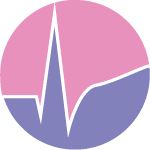 In typical cases of atrial flutter the atrial rate is around 300 beats per minute with a 2:1 block, which yields a ventricular rate about 150 beats per minute. 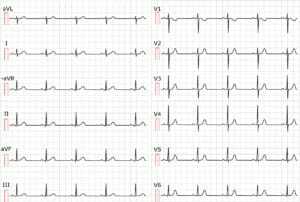 One should always consider atrial flutter when confronted with a regular tachyarrhythmia at 150 beats per minute. Note that with paper speed 25 mm/s, which is standard in the US and many other countries, a 2:1 block will be difficult to discern beacuse the flutter wave may fuse with the preceding T-wave. Increasing the paper speed to 50 mm/s or applying carotis massage (which increases the atrioventricular block) will be helpful in such situations. Figure 2 shows another ECG with atrial flutter. Figure 2. 3:1 conducted atrial flutter. 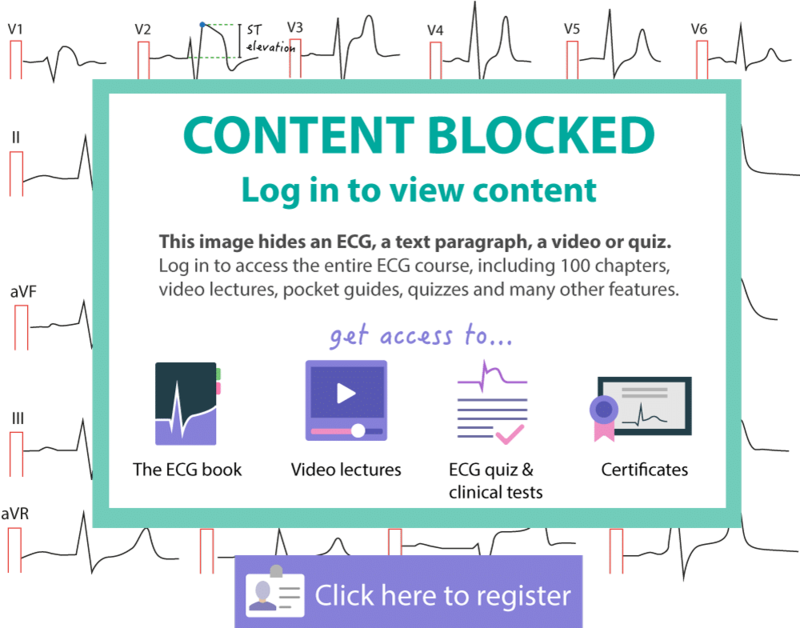 Note that the degree of block in the atrioventricular node may vary from one cardiac cycle to the next and this yields an irregular ventricular rate. 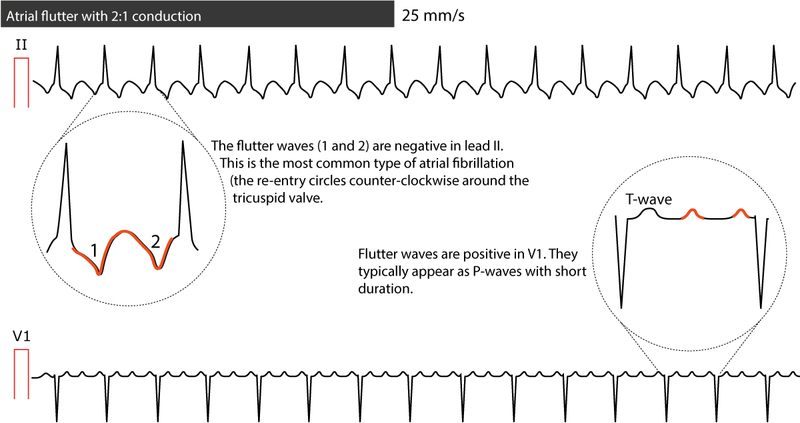 As seen in Figure 3, however, it is usually simple to diagnose atrial flutter with irregular ventricular rate because the flutter waves become clear at longer RR intervals. Figure 3. Atrial flutter with varying AV-block. Atypical atrial flutter is a consequence of cardiac surgery or extensive ablation therapy. These interventions may cause atrial flutters with very varying ECG appearance. However, flutter waves can still be seen and a history of ablation therapy or cardiac surgery will be sufficient for diagnosing an atypical atrial flutter. The probability of spontaneous conversion to sinus rhythm is low, as compared with atrial fibrillation. Moreover, pharmacological cardioversion is not particularly effective. Vagal stimulation can be attempted and it sometimes terminates atrial flutter, or at least elucidates the flutter waves by increasing the RR interval (by increasing the AV block). Second to vagal stimulation, electrical cardioversion is the choice of therapy. A synchronized shock with 50–100 J energy will be sufficient in the vast majority of cases. Should the atrial flutter convert to atrial fibrillation, another shock at 200 J is given. If pharmacological cardioversion is considered, ibutilid might be the primary choice with up to 70% success rate. Procainamide is an alternative. As with all antiarrhythmic drugs, there is a significant risk of arrhythmias that are more malign that atrial flutter, which is why care and experience is needed. The risk of systemic thromboembolism must also be considered. Although the risk in atrial flutter appears to be lower than atrial fibrillation, guidelines still advocate the use of the same algorithms for anticoagulants in both these arrhythmias. Rate control is difficult to achieve in atrial flutter. Ablation therapy is a highly effective treatment that may cure the majority of patients referred to the intervention. It should be considered early in the disease course.